Nick Briggs, veteran skater, is a leader in effort to prepare the park for the next generation. 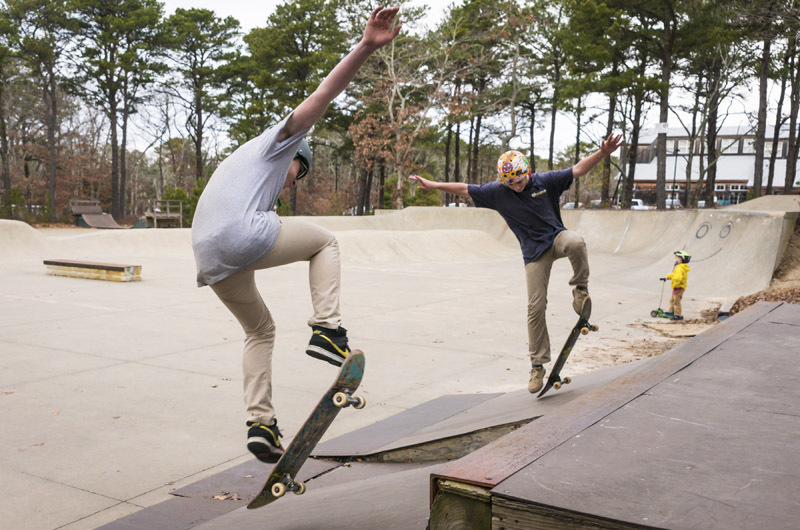 Changing into a pair of Vans behind his car, Gavin Harrer prepared to sneak in a few minutes before work at the Martha’s Vineyard Skate Park. Mr. Harrer has skated nearly every day since he was 15. Now 21, he’s got the relaxed manner associated with skate culture, but the baggy style is gone, replaced by black skinny jeans, a dark denim button up and a black beanie. He was the only one at the park on a mild December afternoon. “It’s always banging in the summer, just a few of us in the winter,” he said. Mr. Harrer skates transition, which has its origins in the days when skaters plied their craft in empty pools. Most of the Vineyard park is designed for transition, with smooth concrete hills forming the northeast corner of the park. If plans take shape as envisioned by leaders at the skate park, new cement is coming. Originally built in 2003 after eight years of grassroots fundraising, the skate park was constructed partly with cement and partly with wood because there was not enough money to use all cement. Those were the salad days for the park, organized and built by a handful of dedicated skaters who had come of age learning kickflips and ollies mostly on sidewalks and in empty parking lots. Centre street in Vineyard Haven was a favored spot called the ledge, a bumpy patch of sidewalk where young skaters would hang out. Today the Martha’s Vineyard Skate Park Association is a registered 501c3 nonprofit. And the skate park, situated across the road from the regional high school near the ice rink, needs an upgrade. To that end, a project to refurbish the park is in the works. Board members, most of whom are skaters, have taken inspiration from outside skate parks, drawn up their own designs and hired the architectural engineering firm Stantec to create a conceptual plan. The design features raised structures around the edges of the park with smaller fixtures such as flat bars and pump bumps, and open space in the middle. The footprint of the park will remain the same. The upgrade is expected to cost $300,000. The association has raised about $40,000, is applying for an MVYouth grant and also in the process of approaching towns for Community Preservation Act funds. Erik Albert, president of the board for the association, said the park needs to be accessible to skaters of all ages. “I’m pushing 50 now, I want something I can skate forever,” he said during a recent interview at the park. Rolling to a stop, he pointed out where he thought a bowl would be the best fit. Reached by telephone, Elaine Barse, former president and one of the original organizers of the park who owns the Green Room in Vineyard Haven, agreed. “To have a successfully designed park, you need to have it challenging to the experts and accessible to the beginners,” she said. Once the park is rebuilt and refurbished, the association has long-range plans to expand its summer drop-in clinics, along with demonstrations and competitions. Organizers have already overcome the most difficult hurdle, which was finding land to build on. The skate park is leased to the town of Oak Bluffs by the high school, insured through the town and located near a bus stop. The new YMCA building is directly behind it, in what used to be scrub oak forest. Other planned improvements include lighting to keep the park open later (current closing time is at dusk), platforms for viewing demonstrations and more permanent fixtures. Already the park is a destination for some summer visitors, but with the update, skate park association leaders think it will become more of a draw. Richard Medeiros was 14 when the park was built. “It really brought a lot of guidance from older guys; there was a big support system that kept me skating,” he said. “It’s the kind of place that keeps handing down to the next group of people. What... No photo of Gavin? Why not stage competitions, attracting off island talent and charge a fee to compete and to attend/spectate; invite food (and other) vendors and charge them a fee (or get a cut), etc etc. Would up the profile, raise $$ and be a fun attraction. Off season of course. And assuming you can get the permits to do so! !